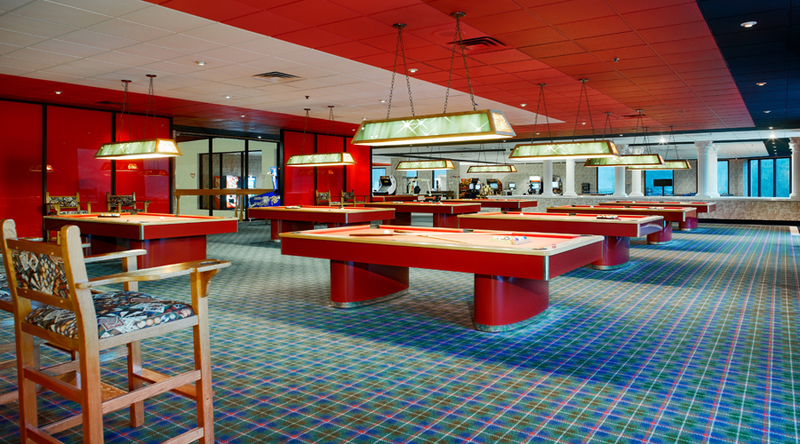 Pocono Palace Resort - Route 209, Marshall's Creek, PA. A couples only "All Inclusive" resort only, Pocono Palace offers varied accommodation styles at a sporty, sensuous resort. A world-class golf course, tennis, a mountain lake, water skiing, horseback riding, scenic bicycling, and a sandy beach are just part of the summer fun, while the winter's snowmobile trails and Cross Country skiing help make this a yearlong playground. 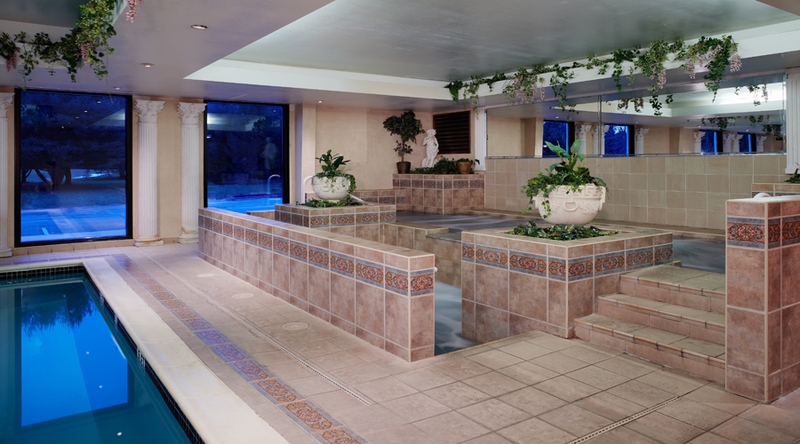 State-of-the-art exercise equipment, whirlpool baths, heated indoor/out pools are available. Enjoy entertainment on the premises in the elegant Gladiator Lounge and gourmet feasts in the romantic Venus Court Dining Room. The Champagne Honeymoon Experience, luxury accommodations, entertainment, activities, and dining. Activities are weather permitting. 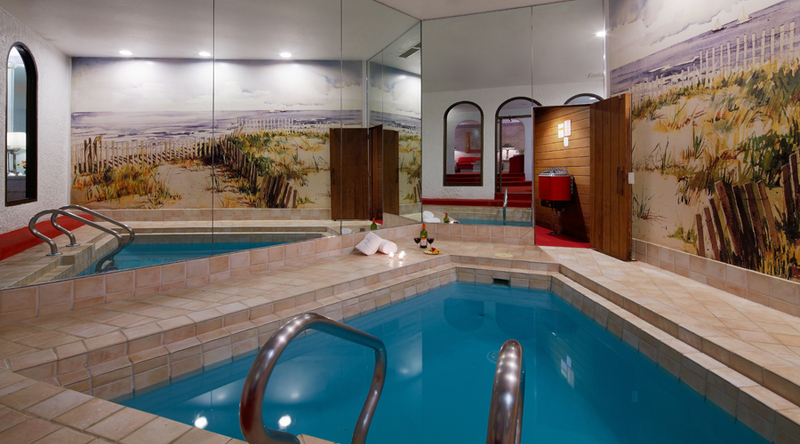 Poconos Palace carries through with the Roman theme for couples getaways. Some find it sophisticated and some find it romantic and yet other find it odd. 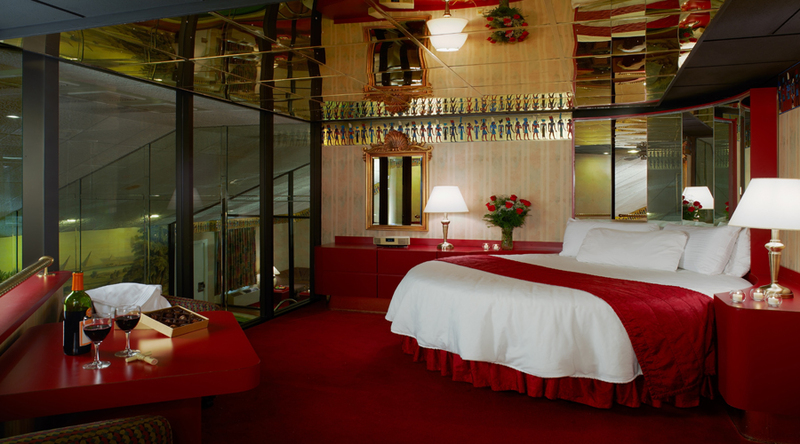 There are round king sized beds, heartshaped pools and whirlpools that look like giant champagne glasses. 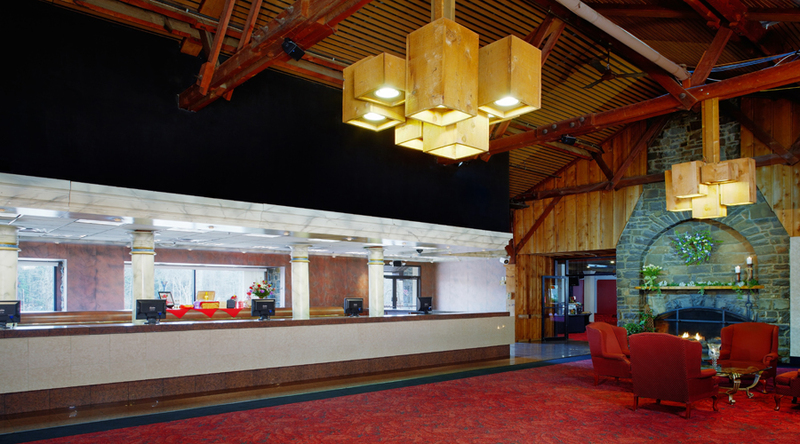 The exterior of the resort has a Roman inspired facade with the colors and decorations in the interiors a carry over. 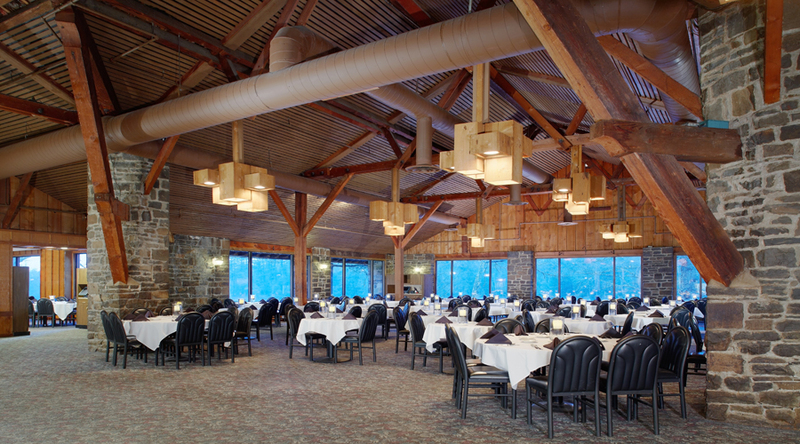 While rustic, with wood beams, event the restaurant with its panoramic views of a private evergreen lined lake, still has a Venitian theme. 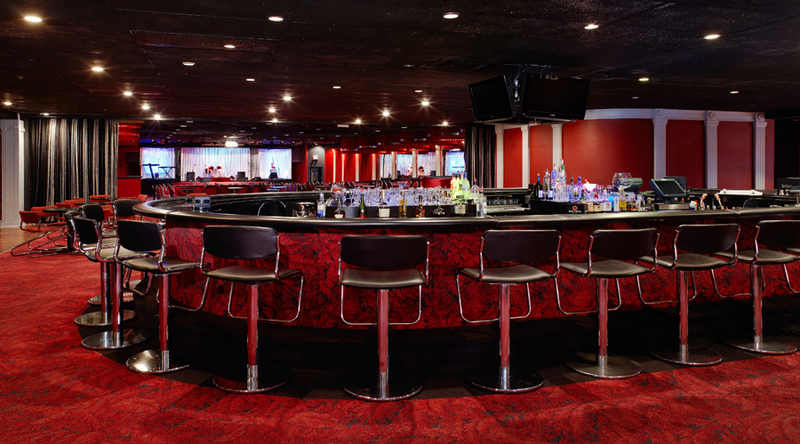 The Lions Den Lounge with nightly entertainment, hors d'oeuvres and sports waitresses in skimpy goddess custumes. 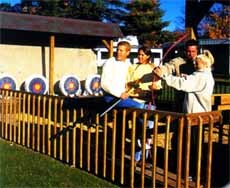 There are lots of activities like archery, basketball, billiard tables, cycling, fishing, game rooms, nine-hole golf course, indoor mini-golf, health club, in winter, ice skating, paddle boats, heated indoor pool and whirlpool, outdoor pool and whirlpool, racquetball, roller rink, row boating, canoeing, sledding, snowmobiling, tanning beds, tennis courts and waterskiing. There are no pets allowed. Rooms are decorated in passionate palates like red, purple and pink. Since this resorts is for grown ups you won't find the Disney channel on the TV. 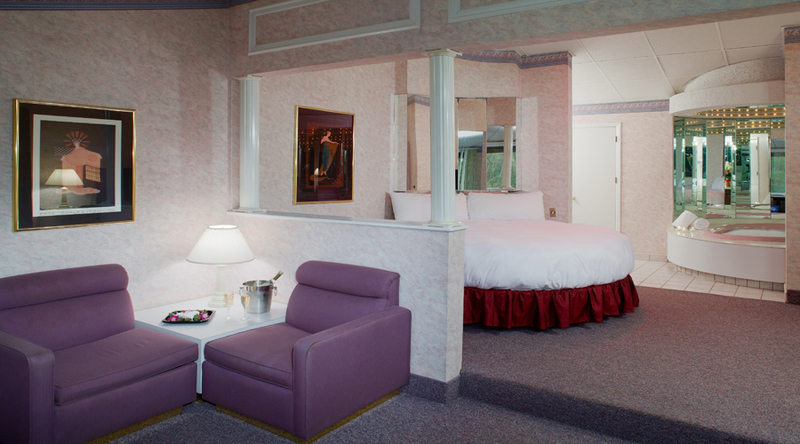 Fantasy Apple Suite - Amenities include three levels of romance. Private heated pool with adjoining dry sauna, Heart-shaped whirlpool bath-for-two, log burning fireplace, round king size bed with mirrored headboard, double sinks, heat lamp, 27" remote control TV, private furnished balcony overlooking beautiful Echo Lake. The living room offers you sleek custom furniture, 20" remote control TV with AM/FM radio, Individually controlled air conditioning/heating unit and Personal refrigerator. 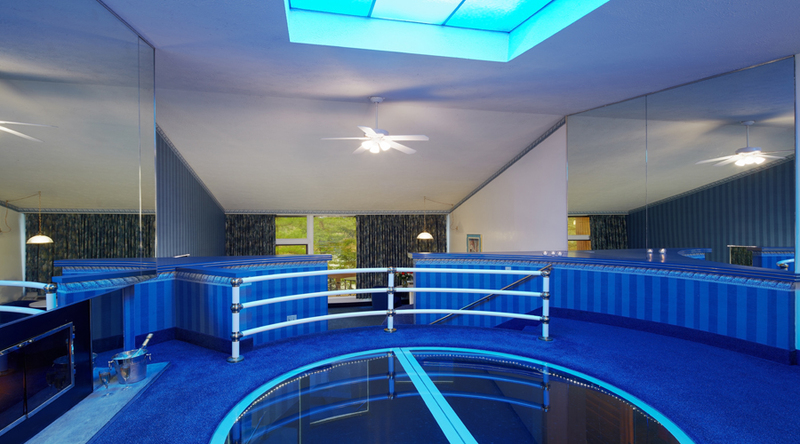 Amenities includes windowless, private, suite. World Famous Heart-shaped whirlpool bath, private indoor heated swimming pool surrounded with imported Italian tile, dry sauna, log burning fireplace, 36" remote control TV with VCR in BOTH the bedroom & living room, Bose Lifestyle music system/CD player with speakers throughout the suite (including the pool area), round King-size bed, mirrored headboard, double sinks, walk-in closet, Individually controlled air conditioning/heating unit and Personal refrigerator. 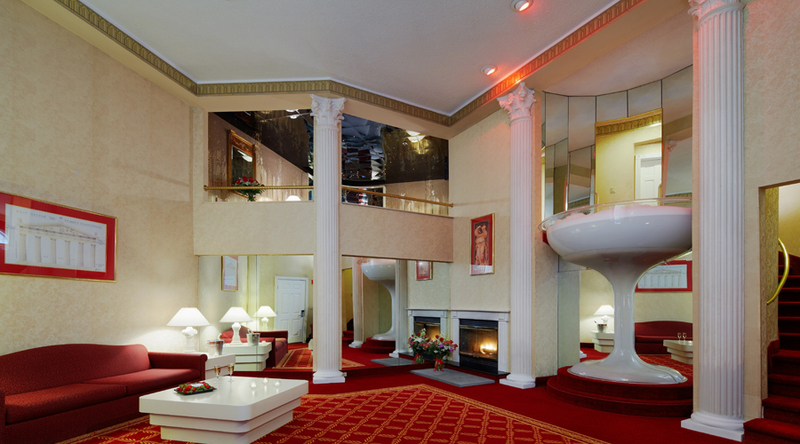 The Champagne Towers by Cleopatra Suite - Amenities include lavish four-level suite with an elegant Egyptian theme. 7-foot Champagne Glass Whirlpool Bath-for-Two with celestial ceiling, glass-enclosed, heated Heart-shaped swimming pool surrounded by imported tile and stunning Egyptian mural, log burning fireplace, round, king-size bed with celestial ceiling, 2--20" remote control TV's (one with VCR, the other with a Bose Wave radio), dry sauna, massage room with heat lamp, separate living room combination shower/steam bath for two, double sinks, Personal refrigerator plus more.... Accommodates 2 people. Suitable for couples only. Pocono Mountains 2 hours from Philadelphia and New York City.